↑ Walter J. Moore (1994). 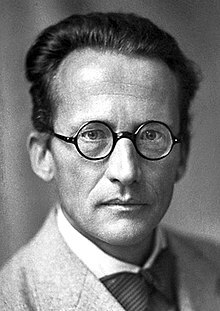 A Life of Erwin Schrödinger. Cambridge University Press. pp. 289–290. ISBN 9780521469340. In one respect, however, he is not a romantic: he does not idealize the person of the beloved, his highest praise is to consider her his equal. "When you feel your own equal in the body of a beautiful woman, just as ready to forget the world for you as you for her – oh my good Lord – who can describe what happiness then. You can live it, now and again – you cannot speak of it." Of course, he does speak of it, and almost always with religious imagery. Yet at this time he also wrote, "By the way, I never realized that to be nonbelieving, to be an atheist, was a thing to be proud of. It went without saying as it were." And in another place at about this same time: "Our creed is indeed a queer creed. You others, Christians (and similar people), consider our ethics much inferior, indeed abominable. There is that little difference. We adhere to ours in practice, you don't." ↑ Andrea Diem-Lane (2008). Spooky Physics. MSAC Philosophy Group. p. 42. ISBN 9781565430808. ↑ Moore: "He rejected traditional religious beliefs (Jewish, Christian, and Islamic) not on the basis of any reasoned argument, nor even with an expression of emotional antipathy, for he loved to use religious expressions and metaphors, but simply by saying that they are naive." ... p. 4: "He claimed to be an atheist, but he always used religious symbolism and believed his scientific work was an approach to the godhead." ↑ Hoffman, D. (1987). Эрвин Шрёдингер. Мир. pp. 13–17.